Digitization is the driving force of change in almost all fields of economic life and the Utilities market is no exception. 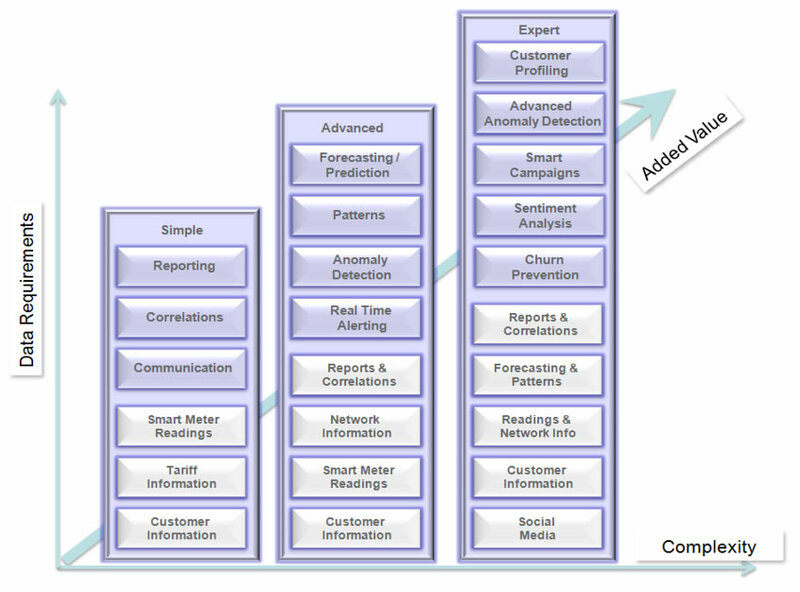 Smart metering, smart grids and associated data management solutions essentially reflect this trend. These infrastructures lay the foundations for innovation and experimentation that is further supported by the open market. The success in this new era relies on industry's ability to adopt Big Data Analytics technologies; it is essential that Utilities, as key actors and stakeholders in the delivery of benefits to the community, take full ownership to enable this digital transition. Based on its BigStreamer™ platform, Intracom Telecom is offering a unique portfolio of solutions that facilitate Utilities harness the merits stemming from data generated by smart meters, intelligent grids, customer interactions as well as any other internal or external source. Customer Profiling and Segmentation: By effectively utilizing energy data and combining it with weather information, tariff and billing details, BigStreamer™ for Utilities creates accurate profiles per consumer or segments of consumers. Profiles include real time reports, usage patterns (e.g. trends, correlation with the weather / geographic area), historic insights and many more. Forecasting: BigStreamer™ for Utilities generates predictions per hour, week, day, month and associated costs. Personalized Communication: Building on the extracted profiles and derived predictions, BigStreamer™ for Utilities crafts suggestions regarding alternative tariffs schemes or behavioral changes. Anomaly Detection: BigStreamer™ for Utilities highlights potential anomalies ranging from the network to individual consumer level. Customer 360 view: From the perspective of the Utility, BigStreamer™ for Utilities builds an holistic view of the customer facilitating interactions and strengthening the relation between him/her and the company. Campaigns: Combining all customer related information BigStreamer™ for Utilities can support the creation of meaningful and highly personalized campaigns. These campaigns include suggestions to save money, indicate hidden saving opportunities, offer economic incentives for peak-load management or simply offer rewards for campaigns opt-in. BigStreamer™ is a powerful analytics suite built on the latest Big Data technologies. It can process and aggregate huge amounts of raw data in real-time, identify apparent or latent correlations, calculate real-time KPIs and compare them against thresholds representing business objectives, send alerts, trigger actions, generate forecasts and provide the User Interfaces to access raw or processed data. BigStreamer™ leverages data retrieved from a variety of sources such as smart meters, grid operation logs, CRM systems, social media and any other structured or unstructured data source available in an enterprise's ecosystem. BigStreamer™ employs an extensive set of data mining and machine learning libraries enabling knowledge extraction from the accumulated data collections. Supported analytics range from simple metrics' calculation and KPI quantification to descriptive/predictive modeling, optimization modeling, real time analysis, sentiment analysis etc. Additionally, it facilitates the tuning of any algorithm or procedure by means of a semi-supervised closed feedback loop mechanism. All information is available via APIs to third party applications for further processing or visualization. Finally, Big Streamer's visualization provides advanced visualization and reporting capabilities. The component architecture supporting the above functionality is depicted in the figure.